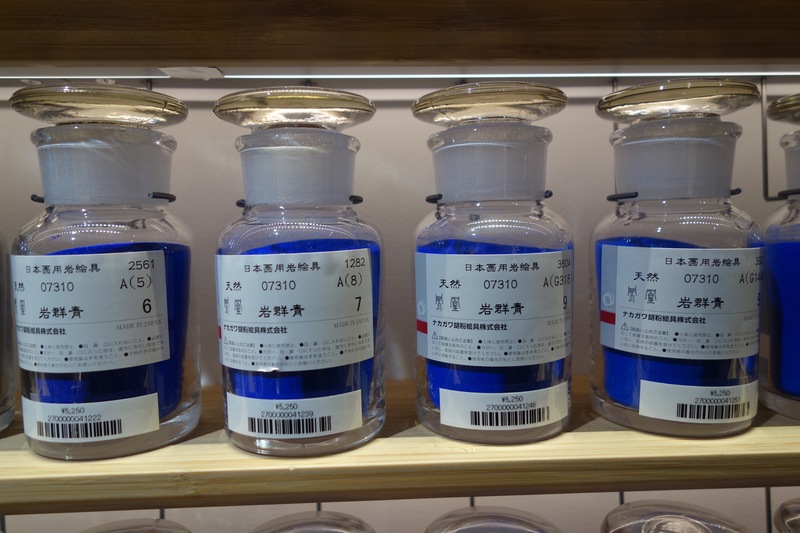 I first discovered the PIGMENT store in Tokyo on the web… it arrived one morning in my daily Flavorpill (thank you guys by the way you do an awesome job of weaving an international artistic community), and after clicking on the link, instantly, just like that, I was in love! In a second I knew I needed to get to Japan some day and… many many moons later an opportunity came while my son was studying there. He was raving about Japan but little did he know that taking mamma on tour would lead him into dark little alleys where ink makers still produced the pigment for their sumi sticks, up long country roads to small factories where charming old ladies were making brushes in the same way they have been made for centuries or to the oldest paper store at the other end of Tokyo… which is BIG! (Actually, I suspect he had an idea but perhaps not how challenging it would be to translate words like lightfastness, particles, rabbit skin glue and hog hair!) Without him though I could not have done it, nor have understood at all the wonderful people we met, uber skilled artisans but no linguists! Anyway, back to PIGMENT… It takes a while for me to even comprehend what I’m looking at. I have NEVER seen so many pigments in my life. (The brochure boasts over 4200 and I’ll take their word for it!) I didn’t even know there could be that many pigments suitable for an artist’s purpose but slowly I go down the aisles and after a little while begin to understand they seem grouped in batches (of ten it turns out). Ten white bottles sitting on a wall… humm rings a bell but probably the wrong one (and you really do not want any of these to accidentally fall!) In reality it is the same pigment but “diluted” ten times. Of course you can’t do that right? Pigments are insoluble. But it turns out that if you rinse them through water and sieve them, slowly by surely with finer and finer grids you will get samples of coarser to finer particles… and these don’t catch the light in quite the same way and so we don’t see them as quite the same colour! AMAZING! But of course dear Watson, I did know that! That’s how artists were duped during the Renaissance into buying second or third quality ultramarine (not that the “washed down” subsequent versions didn’t have colour but they failed to keep the amazing intensity or brilliance that patrons were prepared to pay a price higher than gold for then.) When we play in oil or acrylics we mix our colours a fair bit and layer them too, so we don’t really need that many colour spaces as starting points. However, if you look at some watercolour ranges… 244 colours in Daniel Smith, 110 in Schmincke, 96 in Winsor and Newton, 108 in Holbein, that’s many more than in the average oil or acrylic range. Oriental paintings are mainly done on paper or silk so there’s hardly a second chance, what you apply is what you’ll get. So if you wish to be accurate and consistent, it might be a good idea to start with the colour you really want, especially in watercolours which are prone to migrating to a paler version of themselves if you add a bit too much water. Is that how they suggest you do it here? 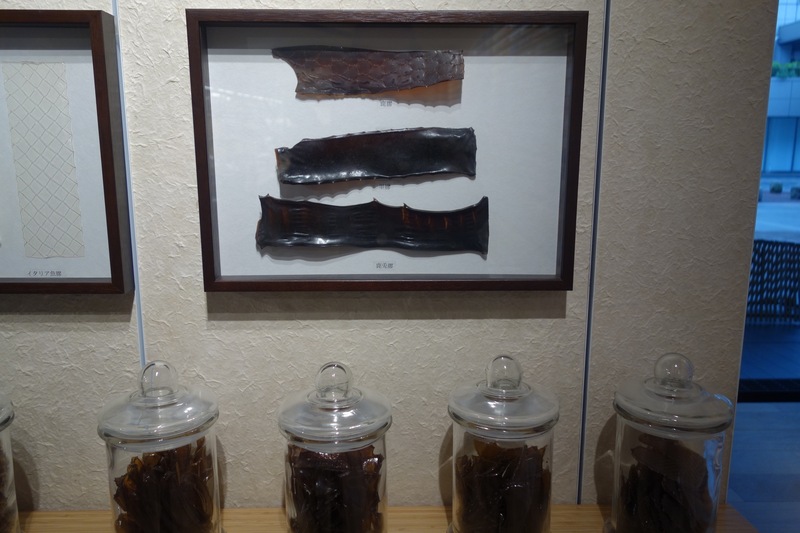 It was a bit hard to really understand but it seems that yes, the traditional Japanese way of making colours is for the artist to simply mix in a shallow dish a pigment with an animal hide glue. Melt the glue in a little bain-marie and mix it with your pigments for a home made watercolour/ink sort of paint. You don’t need that much glue either as your paper/silk support will do the job of drinking in that pigment and not releasing it later. 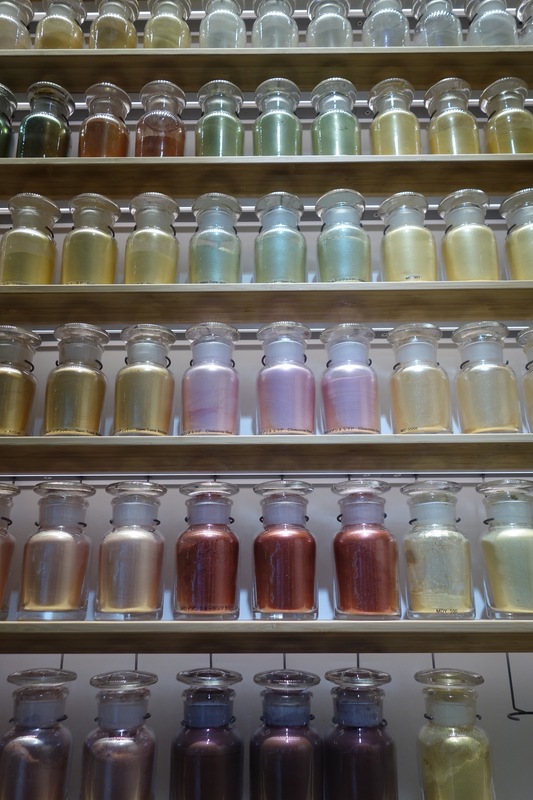 This artist -at the Fudenosatokobo brush museum- was certainly working just like that and making his colours straight from little vials of pigment into a myriad small dishes. Do they have pigments I’ve never seen before? I should imagine so but again not really sure… I managed to single out one family I had never heard of, Gofun, which are white pigments made from shells. 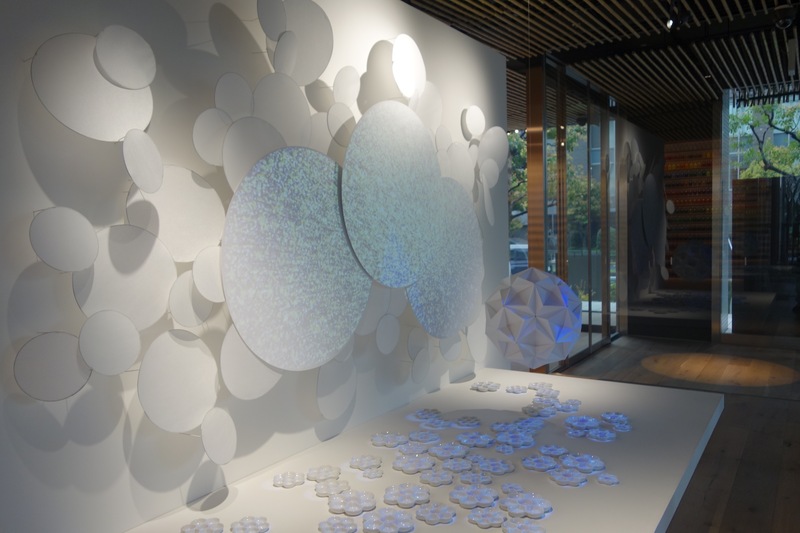 These produce a white which is indispensable in creating a Japanese style painting and is also used for priming. 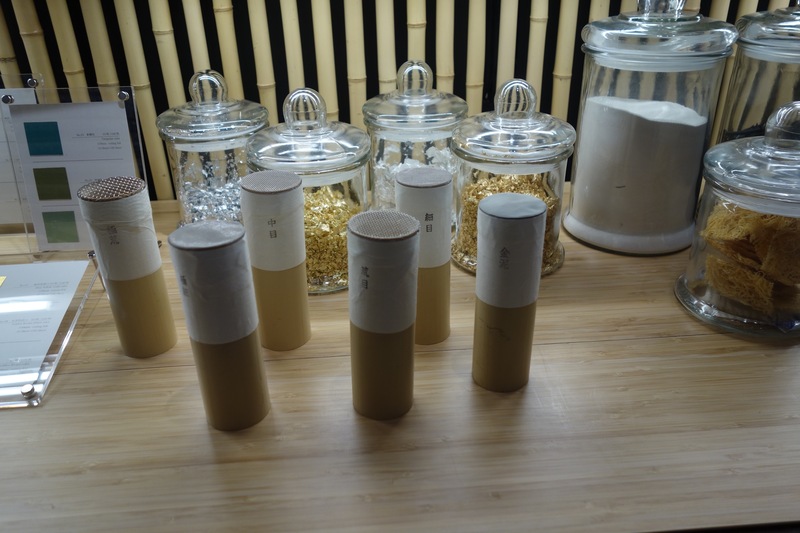 Gofun also turns into an extender pigment in Suihi pigments which are produced by refining with water (水sui) and then drying (干hi) on a cedar board. 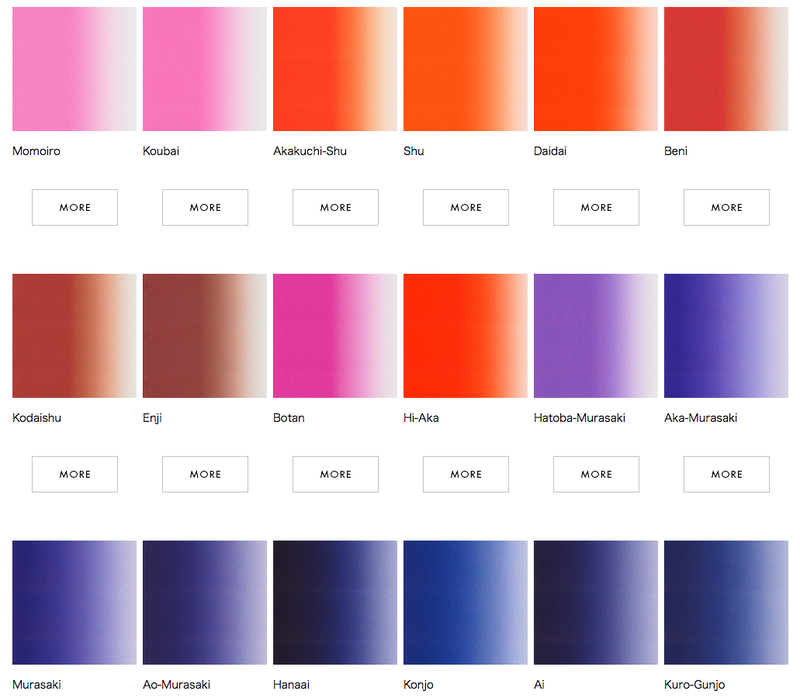 The particles of Suihi pigments are very fine and produce great color. 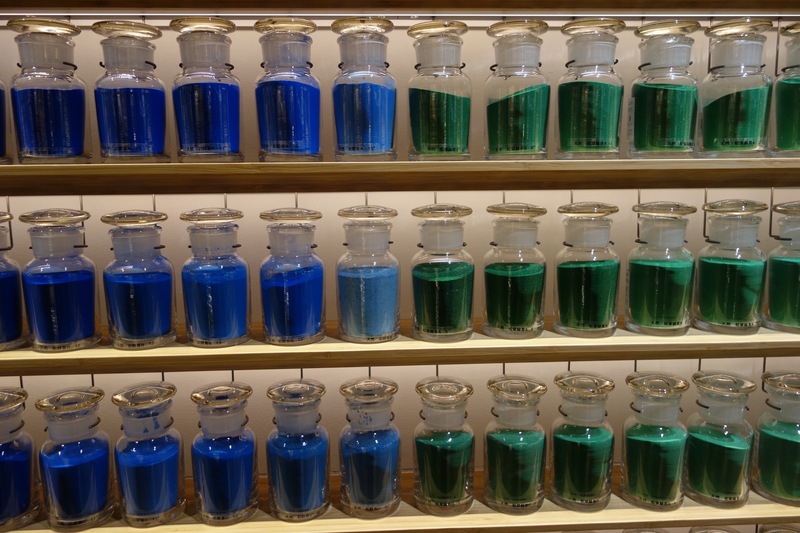 But what are the original pigments made of? Where do they come from? Would there be an equivalent in our pharmacopeia? I can’t tell at all… they do have lovely names though… just not ones I can relate to. Pigments not only come here as dry pigments in jars, you can also get some metallic ones in leaves as they are too soft to handle otherwise. Obviously the traditional gold and silver leaf so often used in Oriental art is offered in variations but also tin, aluminum, copper, brass and the like and some much more mysterious ones like “blue or red pearl leaves” or even a black leaf which they describe as “made by changing the color itself rather than adding color by smoking the silver leaf. This is extremely fragile when compared to the other leaves, and cracks and color unevenness is sometimes mixed in.” I’m racking my brains trying to think of how to use a metallic black leaf with these characteristics… any suggestions? I never thought of it as ‘pigment’ but the red paste still used by everybody in Japan for their seals is mainly cinnabar/vermillion (a mix of pigments actually) and, even in this day and age, you are expected to own a personal seal to apply it to official documents such as your marriage license for example, so there’s still a demand for it. 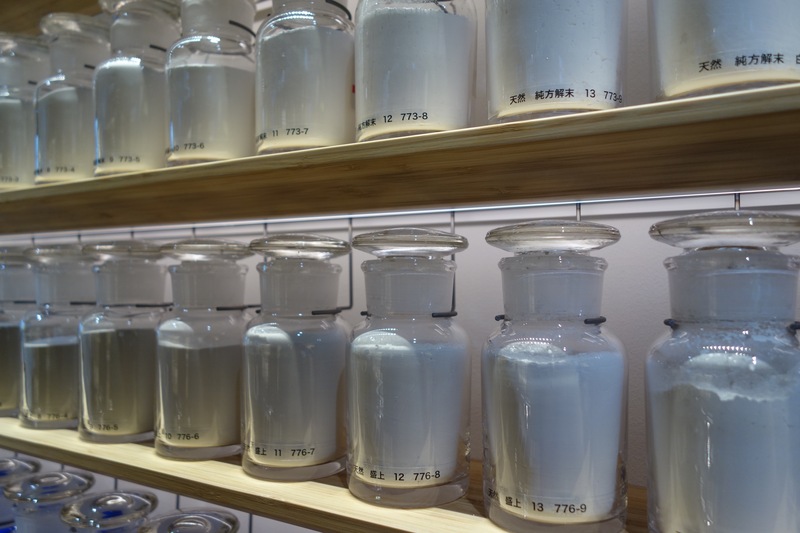 Although the paint making methods are traditional, not all the pigments on the shelves at PIGMENT are. At the end of the line you hit the lovely metallic, pearlescent and irridescent ones which are very recent contributions to the wider family. Seeing how gel pens (invented and made in Japan) offer arrays of glitter and metallic hues, I’m not surprised to hear these are very popular pigments. The store also offers workshops with painters and art materials specialists on how to make your paint, or use traditional tools… “They will bring you new techniques and infinite expressions to support the polishing of an artist’s sensibility.” So if you feel in need of a little polishing of your sensibility… you know what to do… contact them, arrange to attend a workshop or, at the very least, when in Tokyo…. don’t miss this little gem! 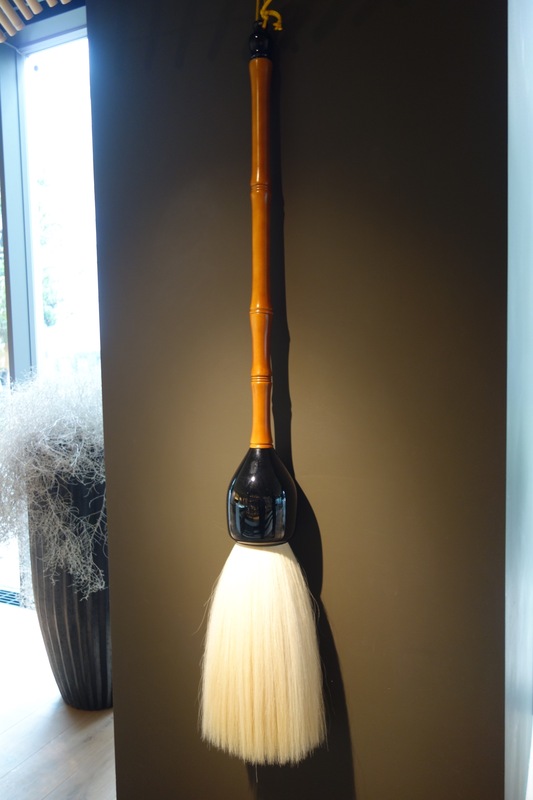 Did I mention they carry the most exquisite assortment of brushes too? Pigments are sold in small quantities -as little as 15gr- and all pigments / glues are available online… not that easy to pick a colour on your screen though. Previous Post in bed with… 166 Golden owners! This is a wonderful read Sabine and what a treat to visit Japan. I hope to make it there one day too. I’m particularly interested at this time in indigo pigment, and have found a way to use it as a print medium on fabric… an ancient Japanese technique… so you can see why I’d like to go there. I’ve signed up for your blog and look forward to more wonderful reads. 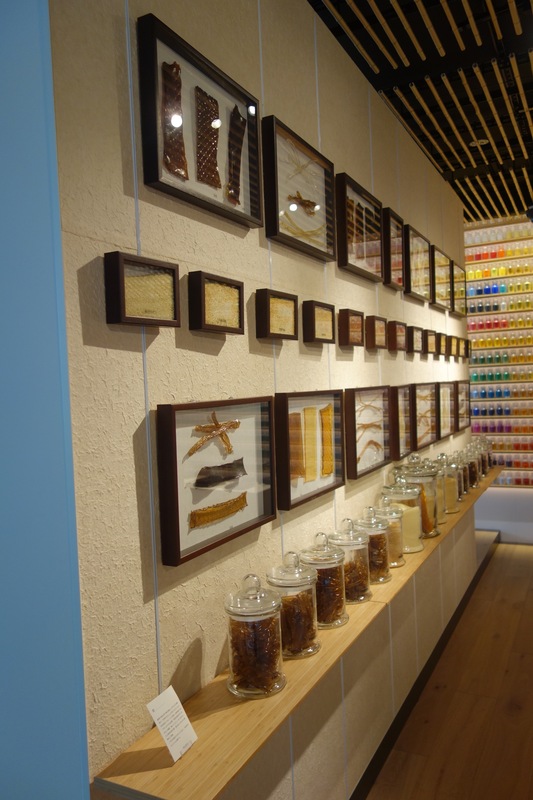 Wonderful story on your visit to Tokyo and excursion to Pigment!! I’m just curious, what did you buy???? 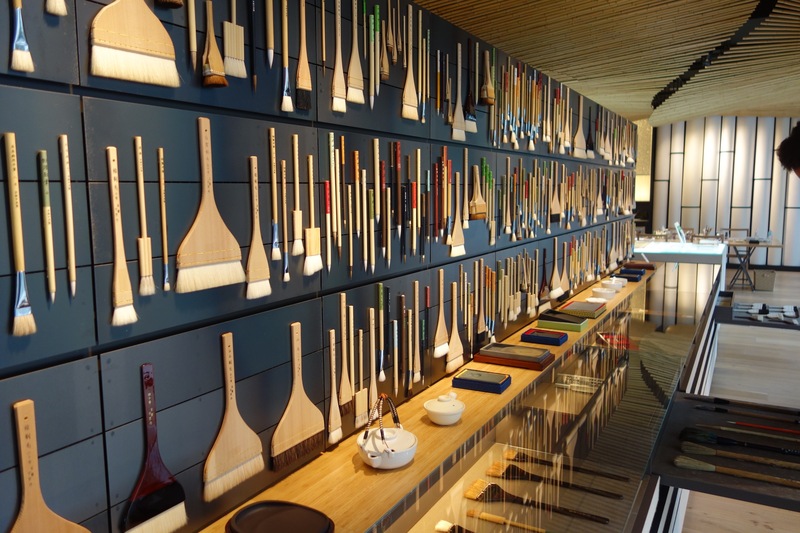 Did you happen to visit Tokyu Hands and the art store at Itoya in Ginza – the one in the alley? Would love to know where all you went. Lived there for 7 years and MISS IT SO!! My first ever trip to Japan was a really short one… only ten days (but I live in Australia so we are not that far away) Yet I would have loved to be there longer and wish to go back some day soon. 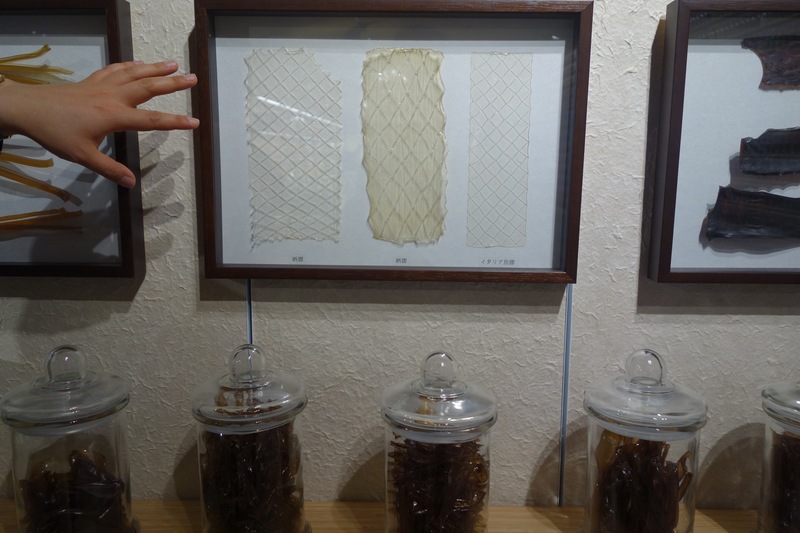 I was in Tokyo but a few day so unfortunately Pigments, The Paper Museum and a beautiful Paper store I shall write about soon are the only places I saw there… Still my whole trip was about art supplies and maybe you will enjoy reading about my visit to Kumano, the brush making village (https://inbedwithmonalisa.com/2016/08/05/a-journey-of-a-thousand-strokes-starts-with-one-good-brush/) and to Kobaien Co. in Nara which still makes the most beautiful ‘Indian’ ink!! (https://inbedwithmonalisa.com/2016/06/17/calligraphy-the-art-of-finer-writing-part-1/) Hope you enjoy these and they remind you of good times in that beautiful country! PS and please recommend any place you believe I should go to next time!! Thank you for those links – will read them NOW!! 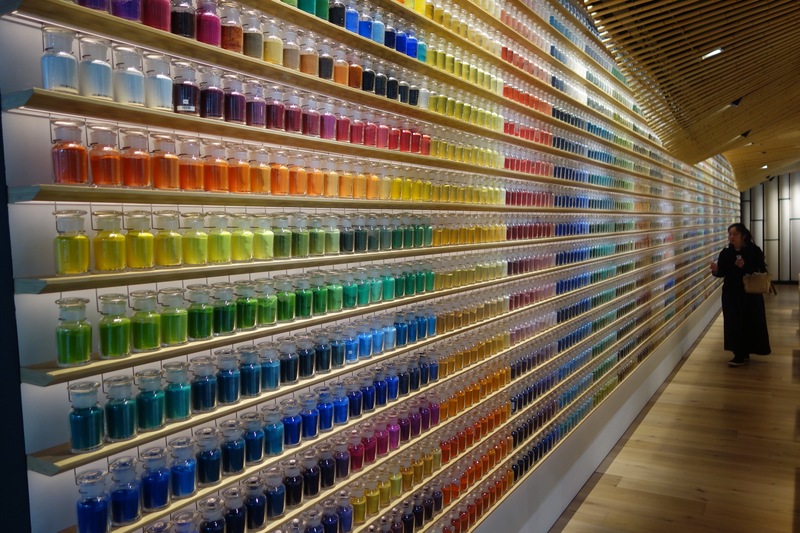 And as luck would have it, I am heading to Tokyo TOMORROW and am going to Pigment – meet me there!! Unfortunately, they don’t have one of their workshops on the schedule while I am there. 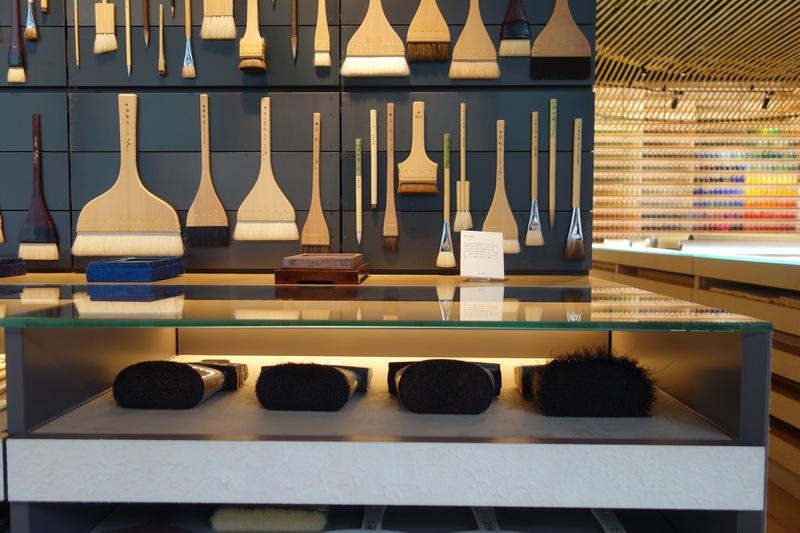 I am happy to share with you my favorite art stores and adventures in Tokyo – it’s a magical place! And thanks again!! !